WALNUT WOLF BOOK REVIEWS. : REVIEW: THE FAULT IN OUR STARS BY JOHN GREEN. 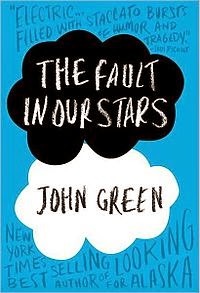 REVIEW: THE FAULT IN OUR STARS BY JOHN GREEN. "Okay," he said after forever. "Maybe okay will be our always." If you haven't read this book yet and do not want the risk of spoilers then please come back to this review once you've read it. I just want to be able to speak freely about the story without the fear of spoiling it for others because i would really hate to do that! Hazel Lancaster and Augustus Waters meet at a cancer support group for kids located in the basement of their local church, AKA the literal heart of Jesus. Hazel suffers from thyroid cancer that has spread to her lungs and now has to carry a oxygen tank with her due to her failing lungs. Augustus has suffered with osteosarcoma but is now cancer free since having his leg amputated and is only attending the support group for the benefit of his friend Isaac. The two meet and it's the beginning of something beautiful and tragic. I'm going to confess now, i have avoided this book like the plague for a long time. After seeing all the tears and pain it has caused people had me running in the opposite direction. So I've avoided it until avoidance was no longer possible and i had to read this story. Because i knew that this book and heartbreak go hand in hand, therefore ugly crying was going to be a sure thing i devised a genius plan on how to attack this book with minimal tears. I thought that if i were to read another book alongside TFIOS then surely with my mind and heart split between two worlds, two stories and two sets of characters i wouldn't become quite as attached to TFIOS and could keep my ugly sobs to a minimum, alas from the first line i was hooked, like a fish on a reel with each turn of a page i was reeling myself in towards heartbreak and the ugly cries, try as i might no matter how hard i tried to dig my heels in i just couldn't get enough. Step two was to read in public, as i am a shy person and the fear of having an emotional breakdown in public would be simply mortifying i thought i could suppress the tears (this by the way did not work, they began to leak from my eyes and i had to put it down. )So i told my sister of my genius plan for her to simply laugh and state it wouldn't work (she's already read it and i can clearly remember her sobbing for an hour) but i was positive i would prove her wrong! "I fell in love with you the way you fall asleep: slowly, and then all at once." So i began this story, pretty much knowing the outcome but no knowing how the story arrived at said outcome or what actually happened through the story. From the first line i realized that i was going to really love this it, i just loved Hazel's voice and they way she was so cynical and witty, so unlike other teenage girls it was simply refreshing. Hazel has been diagnosed terminal since she was thirteen and has to carry her illness with her daily in the form of an oxygen tank that her life depends on. Out of school for the past three years Hazel has become somewhat depressed and a recluse, only attending the support group at her mothers request she would much rather sit at home watching America's Next Top Model and reading. That is until she meets Augustus Waters, super hot, intelligent and impossibly charismatic he makes Hazel feel and want to leave the house and actually live. Many people focus on the point of this book that impacts on all of us have read it, the loss of one of the main characters. But i really feel that as tragic and as heart breaking as it is it over shadows the journey the story takes to get us to that point, therefore i don't just want my review to be about the sadness because though this book also brings laughter and joy, about a boy so full of life and overflowing with energy that he lights up each page with his presence and a girl so terrified of living, fearing the ripple effect and the pain her death will cause, how he changes her look on life and causes her to live again. The friendship and love that is found in 'The Literal Heart Of Jesus' and how it changes and affects these two young people who find joy in reading, live in laughter and wit and ponder their questions of life and death, changing the way they both see the world and what they want out of this life that will never be long enough for them. "It's sad," they said. "You'll love it," they said. "It will make you cry," they said. "But it's worth it," they said. Well they forgot to mention that John Green would rip my weak Augustus loving heart from my chest in his brilliant yet evil hands and annihilate it, leaving the remains pathetic and weeping on the floor as it leaks with all of my feels and pain into the ground at his feet. "That's the thing about pain," Augustus said, and then glanced back at me. "It demands to be felt." This book is not just the story of two people who have cancer and one of them meets their demise. It's a story that is so tragic and beautiful made all the more horrifying from how real and relatable this story is for so many people. There are no monsters in this book, no ghouls or demons hiding under the beds, just the cruel and inescapable claws of fate. What do you do when your faced with the probability that your most likely going to die and soon? Everyone wants to be remembered, to not be remembered when your no longer around does that make you insignificant? Or is it again just the cruelty of fate and the universe to be forgotten? The Fault in Our Stars will make you question so many things along with Hazel and Augustus, What can i do to be remembered? Why is scrambled egg exclusively known as breakfast food? What actually happened after Anna dies in An Imperial Affliction? Yes this book will make you cry (yes my plan failed. Epically.) but it will also make you laugh and open your eyes to one of the most cruelest villains. It will show you that love can be found in some of the most depressed of places and how two people can have such life altering affects on each other. How a boy so full of life and light, overflowing with energy and charisma who fears oblivion and a girl who hated to leave the house seeing herself as a grenade waiting to cause every one she loves pain, found each other and experienced their very own star crossed romance.